Harlin Garrett (Wincott) has been coasting on his enviable name for too long. Formerly a hit man, a mysterious man named Green (Ironside) kidnaps him and forces him to do assassination jobs for his organization. While unsure of his future, he obeys Green until a romance develops with one of his potential targets, Dr. Ann Kendall (Hawkes). When a conspiracy involving the U.S. government starts to spiral out of control, Garrett must hold on to what he knows and survive the onslaught. Can he do it? While we’re not entirely sure what a “killing man” is exactly (is it anything like a Japanese Karate Man?) - what we do know is that this movie is certainly below the talents of the normally-capable Jeff Wincott. Of course, low budgets never bothered us, but the rock-bottom financial situation is painfully evident here. The budget must have been so low, they couldn’t afford backgrounds. BACKGROUNDS! Many scenes take place with a totally black backdrop. Either this is the weirdest episode of The Charlie Rose show yet filmed, or Wincott and the gang are floating in some sort of existential nowhere-land. Even when scenes take place in an actual room, there is no set design whatsoever. Is this a kind of avant-garde theatre production that no one ever goes to see? Regardless, the dark, dingy, bleak, depressing, Canadian vibe permeates the movie. It would all be tolerable if there were many competently-shot action scenes to mitigate the grime. Unfortunately, this does not happen either. A handful of dumb, stupidly-filmed beat-em-ups, again, below Wincott’s standards, don’t help matters. But we do get more than one scene of him walking in slow motion. And his hair, sunglasses and jacket combo make him look oddly like Andrew Dice Clay. You feel that at any moment he’s going to break into a rousing rendition of “hickory dickory dock...” Aggravatingly, the movie as a whole does not play to Wincott’s strengths, like Mission of Justice (1993) did, for example. He’s an able and powerful Martial Artist, with a big likable streak. NONE of those attributes are effectively communicated in The Killing Man. Yes, there is an amateurish alleyway fight, and some type of romance, but the movie’s limitations prevent it from really taking flight. But one thing we did learn is that if you ever send someone a severed head in the mail, make sure you use styrofoam packing peanuts. You wouldn’t want it to get damaged in transit and look bad. Also it made us re-discover the fact that standing on the edge of a building roof is so ‘90s. It seems like every star, from Richard Gere to John Travolta to Jeff Wincott took the elevator all the way up there and stood up and looked out into the distance. For extra dramatic effect, you could also extend your arms in a Jesus-like pose. Just ask Mr. Jones (1993), Michael (1996), or Phenomenon (1996). If you have any other examples, feel free to leave a comment. One thing we as audiences should demand is that our movies have actual backgrounds. Is this too much to ask? Lighting issues be damned, we want to see where you are. Of course, The Killing Man has nil production values, but director Mitchell should really know better. We’ve seen a surprising amount of his work: Thunderground (1989), Mask of Death (1996), Last to Surrender (1999) and UKM (2006) - but we have yet to see him do anything exceptional or noteworthy. Featuring the typically-90’s rock song “Drying Well” by Gangland, don’t be fooled by the cool box art. This particular Killing Man needs more testosterone. Also check out a write-up by our buddy, DTVC! Jeff Wincott should have continued making martial-arts movies in the mid-90s. Many of the movies he made at this point seemed to concentrate on a low-budget plot instead of action scenes. I wonder why he made this decision. Great point Roger! We wonder why too. It's not too late for him to make a comeback though. I thought Last To Surrender and Mask Of Death were both exceptional, though this one was admittedly not that good and kind of boring. 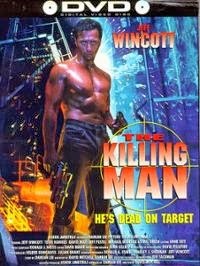 When it comes to Wincott, you're better sticking with stuff like Last Man Standing, Open Fire, Land Of The Free, Memorial Day, The Expert and Deadly Outbreak. Some Mitchell films I would recommend you check out are Thunderground(AKA Boxcar Blues), Busted UP and City Of Shadows. Last To Surrender was a lot of fun. Last Man Standing is a classic. Will look into City Of Shadows.